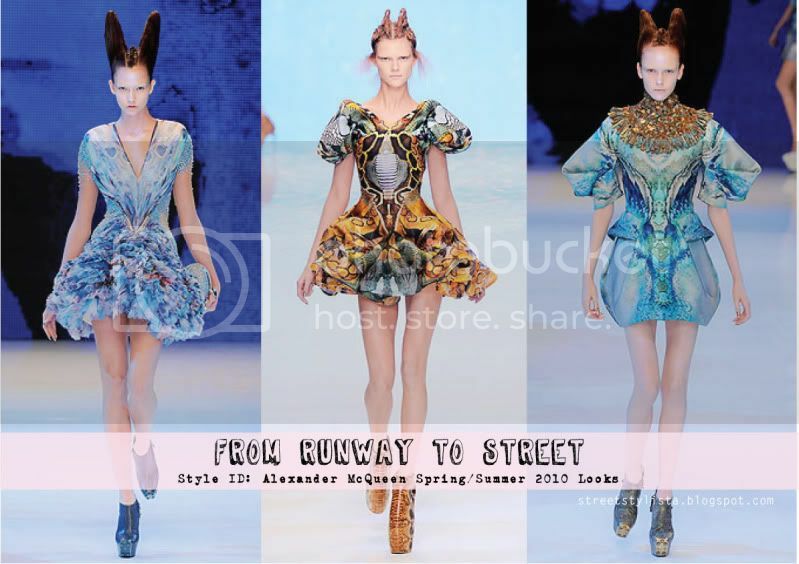 Alexander McQueen Dresses (with the equally amazing shoes!) from Spring 2010 RTW Collection. First spotted in Lady Gaga's 'Bad Romance' MTV shortly after the collection was shown at Paris Fashion Week last year, the amazing pieces from McQueen's Spring 2010 collection have since been spotted on celebrities and one Singaporean fashionista. Camilla Belle in a gorgeous piece which Karlie Kloss wore during the runway show. Not exactly familiar with her to be honset, I remember reading that she used to date a Jonas brother. Yup, I remember tabloid nonsense. Daphne Guinness in another dress with the amazing jewelled neckline from the collection. She's also wearing the towering Armadillo shoe which was one of the most talked about footwear for the Spring 2010 collections. Something different though was that she styled the outfit with the huge silver metal gladiator-ish belt. I personally liked the original look without the belt more. What do you think? Oh! Look who I spotted?? For those of you not living in Singapore, you might not be familiar with her. Dr Georgia Lee is a famous aesthetic doctor here in Singapore and also somewhat of a fashionista. Last year at the Audi Fashion Festival, she had her own show where she walked the runway with an entourage of male models. This year at the AFF, she was spotted wearing the latest designer pieces at all the major shows. Here, she is photographed at Milan Mens Fashion Week wearing a McQueen printed dress paired with leggings. Random nugget, I read somewhere that she once bought a pair of Balenciaga leggings for 10k or more? As much as I <3 Balenciaga, it's kinda crazy IMHO. Missing McQueen already. He was truly one of a kind. No one can ever come up with designs as intelligent and creative as him! So amazing.. But we love the first dress the most.. Even the street version still looks amazing.